After nine months, the police have identified the woman whose body was found behind a truck stop Sumter County as Martha “Jane” Wever. 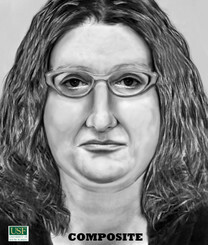 The composite sketch made at the University of South Florida turned out to be so accurate it was recognized by her family who contacted the police. Subsequently the person they believe had something to do with her death has been arrested. Ralph Harold Penrod was living with Jane according to the family. Detectives said Wever was shot, and the motive of the murder was money. Penrod had been living in Tavares, in Lake County, just a few miles from the murder scene, ever since Wever’s death. Previous story: Does this woman look familiar to you? This is the message I received concerning this individual. “I’ve been reaching out to the cardiovascular community to see if anyone recognizes her as a former patient. She has a distinguished appearance having red/auburn hair and red/pink glasses; size 3XL; missing her lower teeth. Metoprolol was found in her tox screen; it’s a heart/blood pressure medication. You can also read more about her by clicking here.